I spent my spring break in Alotenango, the poorest municipality in Sacatepéquez, Guatemala, an underdeveloped country just south of Mexico. 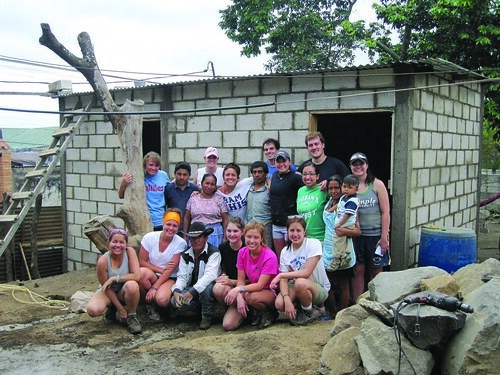 It was a service trip planned by the organization Encountour, which partnered with Benedición de Dios, a nonprofit that works to break the cycle of poverty in Alotenango. They worked to help nine Temple students and four College of William and Mary students find a family in need of a home. Courtesy Encountour Temple and College of William & Mary students, who were organized through Encountour, pose outside the house they built with the new owners in Alotenango, Guatemala. In six days, I built a cinderblock house, approximately 30 feet by 15 feet with a cement floor and tin roof. The construction team was led by Chilo, who showed fearlessness as he broke blocks, stood atop the narrow walls and hammered to his heart’s content. His passion for the family and the organization’s mission was greater than any language barrier that came between us. We built the house for Thomas and his wife and son, who lived and slept in the same small room as his mother and father. Thomas and his father helped build the house, while his mother and wife helped mix cement. They took out a small loan so they could feel a sense of ownership and pride in the house. Not every family in Guatemala or Alotenango is poor. While the family we were with had to borrow water from its neighbors one day to mix cement and some students had to shower with buckets, other families had running water. The living conditions are practical and energy efficient. Water is precious in Guatemala, so toilet paper had to be thrown into a wastebasket instead of the toilet. Showers were usually cold and short. A workday lasted from 8 a.m. to 5 p.m., so when we were weren’t at “trabajar,” or work, we were with our home-stay families. I lived with two Temple students whose language capabilities varied. Through body gestures and with “mi amigo, mi dictionario” – my friend, my dictionary – I was able to communicate with our family, the De Leons. Through fast-paced post-dinner card games, I came to learn that communication is as universal as having a good time. The De Leon’s told us our Spanish was very good after only three days. Founded by Julio Cesar Garcia in 2002, the mission of the local nonprofit is to end poverty and ignorance in Alotenango through educational services. The house building comes from the belief that safe shelter and academic confidence go hand in hand – without a secure place to go after school, students’ studies would suffer. We took a tour of the school, which was just a few blocks from our worksite. A group of school children lined up in the courtyard and waved. They held out their toothbrushes for a morning squeeze of toothpaste. It’s the only time of day most of them have water to brush their teeth. It’s also the only time of day when most of them are fed a satisfying meal. The school teaches students from preschool through secondary school. Some students start out young, while others enter at the age of 13 or so. Vocational classes are also offered to teach useful life skills. Most students attend the school free of charge, but parents will clean or cook to pay their contribution. Many of the teachers are former students themselves, something they never thought they’d be able to achieve coming from poor backgrounds. Despite all the sadness I felt in Guatemala, an amazing feeling overcame me when we presented the finished house and certificate of ownership to the family. With our rapid work, our task was completed early with time to go on an adventure. Pacaya Volcano National Park is located 31 miles southwest of Guatemala City. There are four peaks, and from the Alotenango worksite, I could see the active peak, Pico Mackenney. Usually Pico Mackenney releases ash, water vapor and lapilli (small stones). When I was there, lava was spewing. Pacaya Volcano is 8,366 feet high. While grueling and arduous at first, it quickly became so exhilarating that the more-than-hour-long hike was effortless. Among the clouds, my view was like heaven. At the top, I ate marshmallows in the blazing heat. On the way back down, I felt thankful for the whole life-changing and self-altering experience. I’ll be back. I want to help Benedición de Dios and visit my family. I want to return to Pacaya Volcano and feel both restless and fulfilled. Melanie Menkevich can be reached at melanie.menkevich@temple.edu.